You may have heard about drivers converting cars and trucks to run on cooking oil instead of gasoline. Now, Ford is using the same general idea to build cars. The automaker's green initiative is growing into an environmental revolution. Researcher Debbie Mielewski works in an industry not known for being green, but make no mistake, she's a true environmentalist. "The major motivator is to reduce our dependence on petroleum and try to conserve the environment, " Mielewski said. She leads a groundbreaking effort at Ford, finding ways to get rid of the oil-based plastics in all of the company's vehicles, about 300 pounds worth per car, CBS News correspondent Betty Nguyen reported on "The Early Show." "What we're trying to do is substitute in things that are more environmental or can grow in this country, and put that into the vehicles for all the plastics around you," Mielewski said. Most other manufacturers are undertaking similar efforts, but Ford's "bio-materials" team may be the most ambitious. The research there is already paying off in a big way. Instead of oil from the Middle East, a lot of the material in Ford vehicles, like some foam used in seat cushions and headrests, is derived from American-grown soybeans. The material, Mielewski explained, used to be made entirely of petroleum, and now the company substitutes up to 25 percent of the foam from soy oil instead of petroleum oil. That adds up to more than three million pounds of soy oil -- a boon for the environment and for farmers. Future materials in Ford's green pipeline will also come from the farm, such as a "bio-seat" that sounds good enough to eat -- made from soy, sugar cane and corn. And that's just the beginning: The fabric, carpet and hard plastics created by Ford's bio-materials team, Mielewski explained, are 100 percent corn-based. 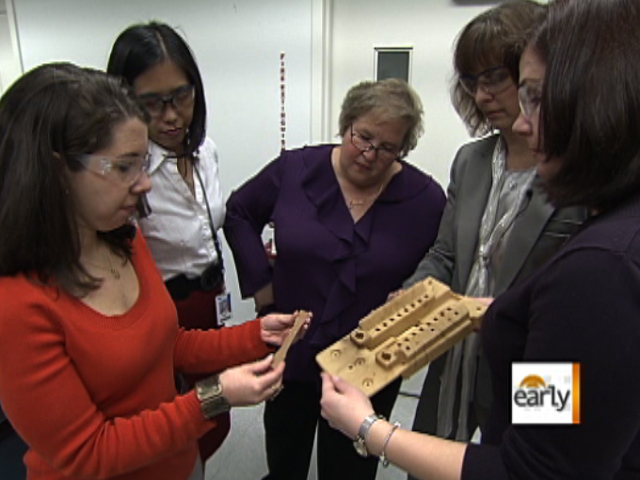 Another distinctive element of Ford's bio-materials team is that the scientists are women. Some call them the "material girls." Plastics research engineer Angela Harris started as an intern. She says having great female mentors has been an inspiration. "When you see someone love their job and you see someone passionate about the environment, or about automotive, it really kind of rubs off on you and becomes part of who you are, and you just can't help but get excited about it," Harris said. So is it just chance that brought these women together or is there some deeper connection? "I don't necessarily know that men don't care about the environment, but we all do have very young children and we all are concerned about resources being there and keeping the planet as clean as possible for the next generation," Mielewski said. Actually, Henry Ford himself was very interested in going "green" before there was any environmental movement to speak of. He built a "soybean car" in 1941, but shelved the project because of the war. "So every time that we think we had a brand new idea, and we start working on it in the lab," Mielewski said, "we'll always run across some old historical document where Henry Ford had already done some of this work, because he felt so strongly about it." Now, hisdreams are finally being realized by a team even he could have never imagined. "Before I retire," Mielewski said, "I would love to see every single plastic material in the interior, exterior and under the hood of the vehicle produced from a sustainable resource." Nguyen added thst the benefits of using bio materials go beyond replacing oil -- they weigh less, improving gas mileage, and they're bio-degradable, which means less plastic in landfills.